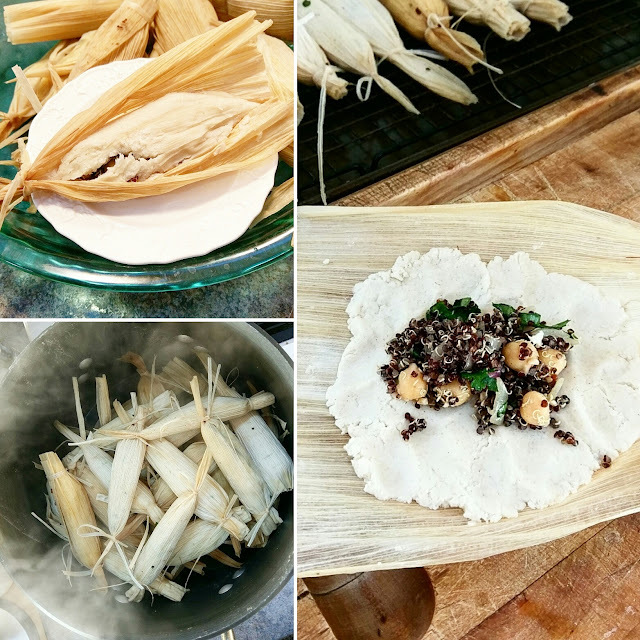 Who doesn't love tamales? Well, everyone at my house can't get enough of them when we make them. The problem is that we don't eat them that often because we don't eat a lot of meat anymore. I got to thinking why couldn't I make them with a plant based filling? Guess what? You can. 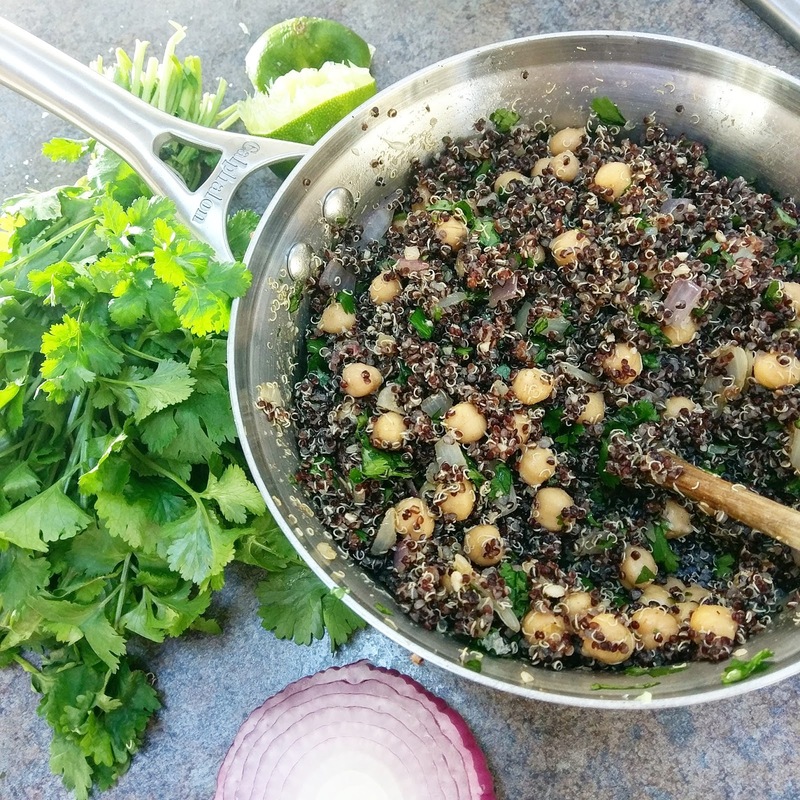 I recently had black quinoa for the first time. It has a milder flavor profile to me. The white quinoa seems bitter even after I rinse it multiple times. This became my base. I added a can of drained and rinsed chickpeas, sauteed red onions, a bit of green onion for color, cumin, chopped cilantro, chili powder, salt, fresh minced garlic, fresh lime juice, and pepper. No recipe was used. I literally added, tasted, added some more, and tasted again. See picture below. Honestly, the filling could be eaten on its own as a salad. I made the masa using the recipe on the package of Masa Corn Flour. It worked like a charm. 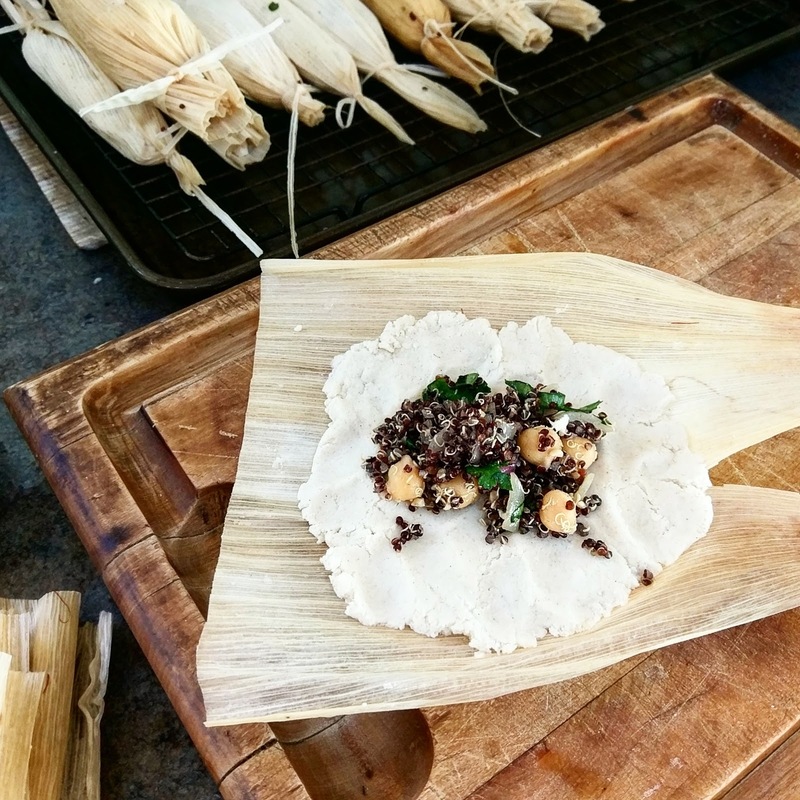 If you want to see a recipe for the dough this site will help you: HERE for the tamale dough. 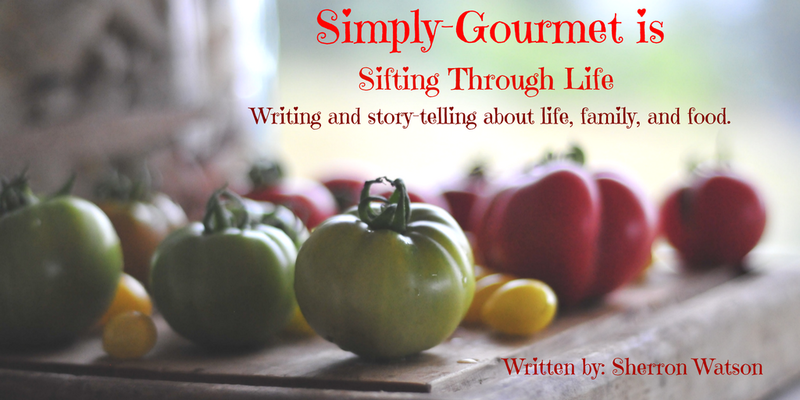 I make the filling, soak the cornhusk, and make the dough about the same time. 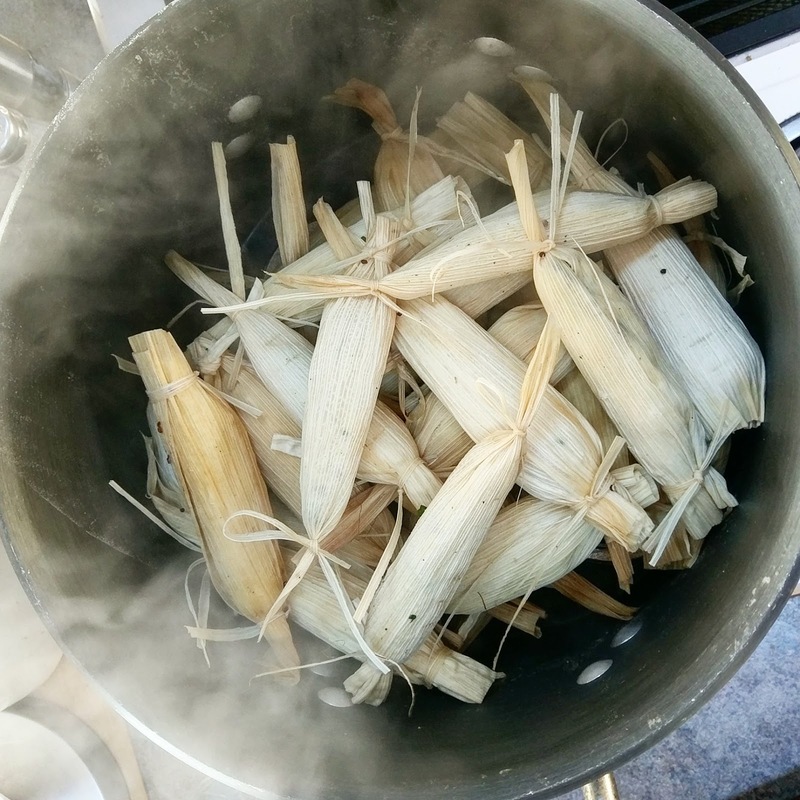 The cornhusk need time to soften a bit, the flavors in the filling can sit and marry, and then the dough can rest for a while too according to directions on package. When your ready to assemble, gather a few things: a cookie tray to stack them up, your masa dough, your filling, and find a work space. I use a cutting board. Take a few cornhusk and shred them into smaller pieces to use as ties on the end of each side of the tamale. See picture below. Spread the dough on the cornhusk. Add the filling. This is how I do it: I roll from one side until the sides meet and then make sure they are sealed. It works. 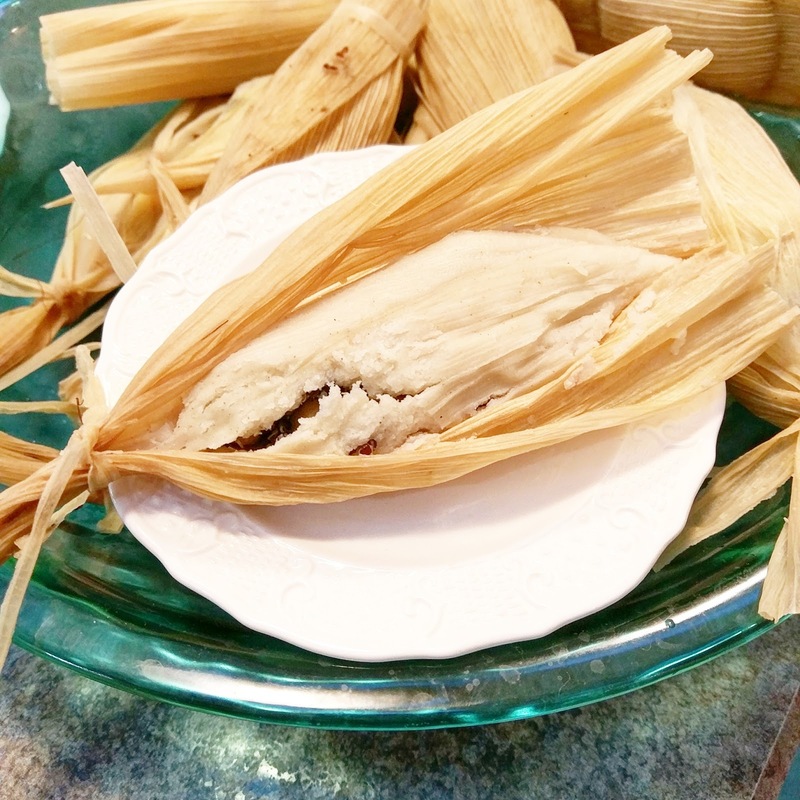 Wrap the cornhusk around the tamale and secure the ends. I have a huge stock pot to steam the tamales in. I add enough water to sit below a rack that I place in the bottom. I layer the tamales so that the steam can easily get around each of them. See picture above. I let them steam for a few hours. I add water about every 30 minutes to make sure that my pot does not go dry. I remove the tamales when they are done. I serve them on the cookie tray. We like ours with ketchup. These tamales reheat well the next day. 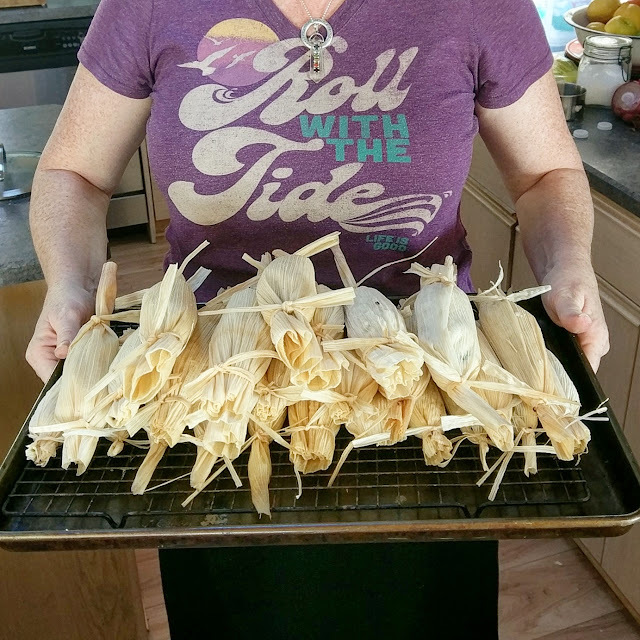 For our family of six I usually make about 30 tamales.